Linda Cliatt-Wayman has spent her career working in low-income, low-performing schools — the same Philly schools she grew up in. She has developed a thick skin and a tough attitude … laced with fierce love for her students. In her TED Talk, How to fix a broken school? Lead fearlessly, love hard, she shares her approach to fixing a broken system and doing right by kids who deserve the best. If you’re going to lead, lead. “What happens in a school and what does not happen in a school is up to the principal,” says Cliatt-Wayman. “I am the principal, and having that title required me to lead.” That meant stepping up and taking charge. “I was not going to be afraid to address anything that was not good for children, whether that made me liked or not.” At Strawberry Mansion High School in North Philadelphia, she worked with her leadership team to tackle issues both small and large. They posted cheerful messages on bulletin boards and made sure the light bulbs worked — and rebuilt the school schedule to include flexibility for children with hugely different needs. But their best invention ever? The school-wide discipline program called “Non-negotiables,” a behavior system designed to promote positive behavior at all times. The result? 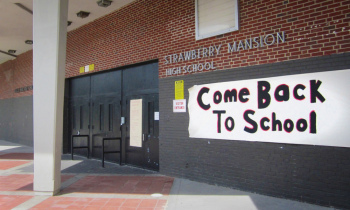 “Strawberry Mansion was removed from the ‘Persistently Dangerous’ list our first year, after being on the list for five consecutive years,” Cliatt-Wayman says. So what? Now what? “There were many excuses for why Strawberry Mansion was low-performing and persistently dangerous,” says Cliatt-Wayman. “Only 68 percent of the kids come to school on a regular basis, 100 percent of them live in poverty, only one percent of the parents participate, many of the children come from incarceration and single-parent homes, 39 percent of the students have special needs.” Her response: So what. Now what? “Eliminating excuses at every turn became my primary responsibility.” That included focusing on the teachers as well as the kids. “We addressed every one of those excuses through a mandatory professional development, paving the way for intense focus on teaching and learning.” Teaching was based on small groups of students to try and ensure they got their needs met in the classroom. If nobody told you they loved you today, you remember I do, and I always will. “If someone asked me my real secret for how I truly keep Strawberry Mansion moving forward, I would have to say that I love my students and I believe in their possibilities unconditionally. When I look at them, I can only see what they can become, and that is because I am one of them,” says Cliatt-Wayman. “I grew up poor in North Philadelphia too. I know what it feels like to go to a school that’s not a school. I know what it feels like to wonder if there’s ever going to be any way out of poverty.” As such, Cliatt-Wayman is both tough and gentle, always pushing her students — and always acknowledging who they are at heart. “My reward for being non-negotiable in my rules and consequences is their earned respect. I insist on it, and because of this, we can accomplish things together,” she says. Here is a direct link to Linda Cliatt-Wayman’s TED Talk.